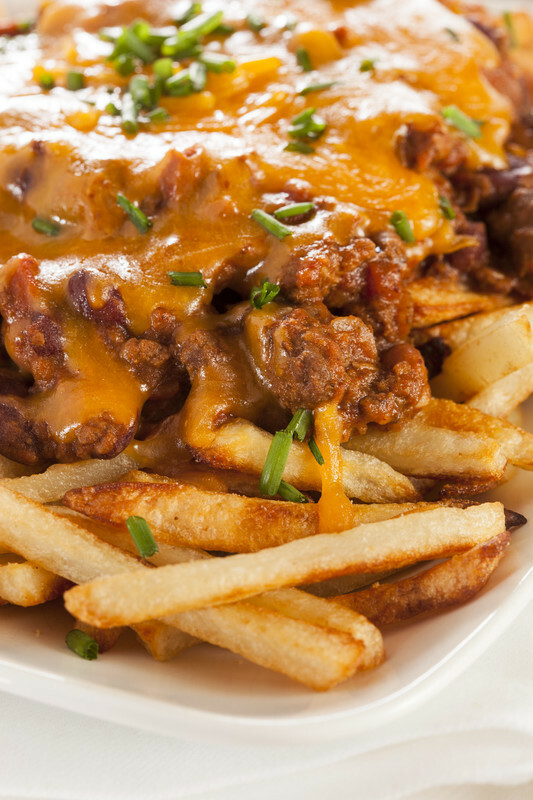 You will love these chili cheese fries. Not only a great appetizer but I have made them a meal topped with cheese, jalapenos, sour cream and green onions. Having ground beef and beans in the chili makes it a hearty option. You should wash and peel your potatoes. I scrub them with a brush when I want to leave the peel on. Slice potato the long way into four or five long pieces. Lay them flat and cut into sticks. You should make sure you slice the potatoes evenly. When you’re potatoes are not sliced evenly, some will end up overcooked before others are cooked. Place the fries in a large bowl and soak the potatoes in hot water to get rid of the starches. For optimum results, let your potatoes soak for about 15 minutes. If you use cold water, let them soak for at least 1 hour or overnight in the refrigerator - it doesn’t hurt them, but what does is leaving the fries wet. You need to drain the water and place them evenly on paper towel lined baking sheets to dry. Pat them completely dry on top before frying with paper towels. Meanwhile heat a few inches of oil in a large heavy skillet or Dutch oven to 300 degrees. Fry in small batches for 4 or 5 minutes - until the potatoes are soft. Remove and again, place evenly on double paper towel lined baking sheets to soak up the oil. Lightly pat them on top to remove oil. Turn up the heat to 400 degrees. When ready drop small batches of fries into the oil and cook until light golden brown. Remove and place on paper bags and season with salt. In a small bowl, mix 2 tablespoons of water and 2 teaspoons of salt with 3/4 teaspoon of baking soda. Stir until dissolved. Place ground beef in a large bowl and lightly break up. Sprinkle with the baking soda mixture. Lightly toss and let sit 20 minutes. Meanwhile make the homemade chili powder (very important to the recipe) and add the whole peeled tomatoes. Puree everything together and set aside. Brown the ground beef in a Dutch oven. While the ground beef is cooking, place a skillet on medium, add the oil. When hot, saute the onion for 5 minutes. Add the minced garlic and let cook one minute. Remove from heat. Pour the pureed tomatoes into the cooked ground beef and add the onion/garlic mixture. Pour in two cups beef broth. Stir in the chipolte chiles, red kidney beans and brown sugar. Cover and simmer on low for 1-1/2 hours to two hours. You may also put Dutch oven in 275 degree oven (make sure it is oven proof) for 1-1/2 to 2 hours. Bring it out and let it sit for 10 minutes. Stir the chili and add the apple cider vinegar. Season with salt and pepper to taste and serve. Place french fries on individual plated and top with hot chili. Sprinkle shredded cheese on top and any other toppings you wish. You will be making this often. Enjoy.